In this file photo, West Virginia Gov. 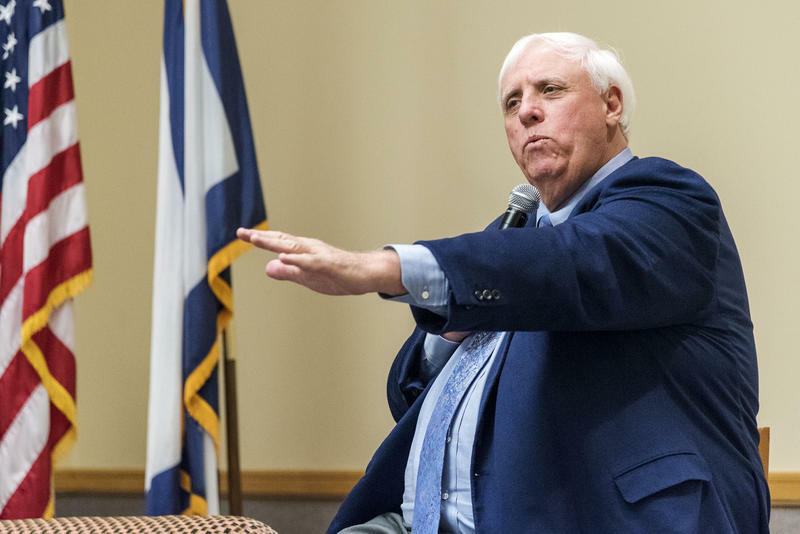 Jim Justice talks about his budget proposal during a stop on his Save Our State Tour on Thursday, March 3, 2017, at Fairmont State University. Among the bills included on the call is a measure establishing the Department of Arts, Culture and History. After a bill dismantling the Department of Education and the Arts -- of which West Virginia Public Broadcasting is a part -- was passed by the Legislature during the 2018 regular session, Justice signed the bill. Earlier this year, Justice had proposed reorganizing and placing agencies under a new department. According to a news release, the commissioner of Culture and History would become the “curator” of the new department, with that person reporting directly to the governor. Justice has also asked for the passage of a bill amending a recently approved law that, among other provisions, doubles the amount of death benefits provided to surviving family members of first responders. The law -- originally set to go into effect July 1, 2018 -- would become retroactive to January 1, 2018 and provide death benefits to families of Pratt Volunteer Firefighters killed on March 24. The call also lists supplemental appropriations bills related to the West Virginia National Guard, the state Department of Military Affairs and Public Safety, the West Virginia State Police and the funding of partnership coordinators to “develop defense industry opportunities” for West Virginia businesses. Additional measures called for in the special session can be found in a news release from the governor’s office. However, much attention has been focused on issues not included as part of the governor’s special session agenda -- including the implementation of an integrity fee to the state’s new sports betting law and a fix to the medical cannabis program. “This was a difficult negotiation between many different parties, but the outcome will be very good for the State of West Virginia as well as the sports leagues,” Gov. Justice said in the release issued Thursday, May 10. However, casino owners say there was no agreement and the announcement from the governor was premature. Some lawmakers also questioned whether the governor violated open meetings laws. Following the dust-up over the meeting and the premature announcement of an agreement, Justice said he was unsure whether he would ask lawmakers to address the integrity fee in a special session. An integrity fee is essentially a fee owed to professional sports leagues for wagering that takes place on their respective games and events. “I think there needs to be some additional discussion. I don’t know if there’s a way to do it without legislation, but I’m an open book. I’m not trying to do anything behind any doors. All I’m trying to do is help West Virginia,” Justice said earlier this week. However, legislators -- including those in the Republican majority’s leadership -- continue to say there is no interest in addressing the integrity fee. “We do not see -- speaking from the Senate’s perspective -- any path towards the state injecting themselves into this private negotiation,” Senate President Mitch Carmichael said earlier this week. House Speaker Tim Armstead echoed those sentiments in a written statement late Monday afternoon. But questions remain about Justice’s motivations for wanting to include the integrity fee in the new sports betting law. According to Justice’s latest financial disclosure -- required under state ethics laws -- various companies related to The Greenbrier are listed as those under which he conducts business. While the casino housed at The Greenbrier Resort would have been subject to the terms of the agreement announced prematurely by Justice, the facility has also hosted a PGA golf tournament, as well as off-season trainings by the NFL’s New Orleans Saints and the NBA’s New Orleans Pelicans. It is unknown how much revenue the professional sports leagues’ use of the Greenbrier’s facilities brings in for the business. Multiple requests for comment on the integrity fee, clarifications on Justice’s financial holdings in the Greenbrier, and his business relationships with professional sports leagues have gone unanswered. Emails seeking clarification on the ownership of the Greenbrier Classic -- a PGA event held at the resort’s golf course -- are also still unanswered. Additionally, calls on Friday requesting comment from the Saints and Pelicans -- who share an owner -- on the teams’ business relationship with the Greenbrier haven’t been returned. Saving the State’s Medical Cannabis Act? While many have paid attention to the debate about Justice’s desire to add an integrity fee to the state’s sports betting law, Democratic lawmakers -- particularly in the House of Delegates -- have focused their attention on saving the state’s medical cannabis program. A bill passed in 2017 created the program, but advocates and lawmakers in support of the program say it is flawed, including a mechanism for the state to legally collect revenue from the program while still following federal law. In a news release last week, the state Treasurer’s office proposed two options for banking solutions for the medical cannabis program. A proposed fix to the medical cannabis program failed on the final night of the 2018 regular session, with House Speaker Tim Armstead stalling and refusing to act on the measure as the clock ticked toward midnight. The fix had passed the Senate hours earlier. Some lawmakers, particularly Democrats in the House of Delegates, want the issue to be revived in a special session. “It's really time sensitive. There is a need for this, the public wants it, the public demands it. It came through the House with overwhelming bipartisan majorities and it should be taken care of,” said Del. Mick Bates, who serves as minority vice chair of the House Finance Committee. In anticipation of a special session call, the West Virginia House Democratic Legislative Committee started a petition to include a fix to the medical cannabis law. The committee says they have collected 668 names who support the issue being included in a special session. However, Speaker Armstead says lawmakers have yet to present a solution that addresses the banking solutions needed to make the program work in conjunction with federal law. "I think any attempt to address the medical marijuana issue in special session right now would be premature. I don’t think any of the proposals, including those offered during the regular session or last week by the Treasurer, go far enough to address the concerns over conflicts with federal money laundering laws,” Amstead said in a written statement Friday afternoon. “Because supporters have not come forward with a piece of legislation that truly addresses the federal issues, I don’t think we should begin spending $35,000 a day on a special session to address this." But Bates says there is talk among the Democratic caucus to force the issue to be taken up, including the possibility of gathering a supermajority of lawmakers in both chambers to call themselves back to work to address it. “If the governor and the legislative leadership does not move on it, then there will be efforts to move them. The first step in that process is the public petition. But there are other things we have planned if we can't get the attention that it deserves,” Bates said. The state constitution allows lawmakers to gather a three-fifths majority of each chamber to address issues without the governor adding a bill to a call on a special session. Requests for comment from the governor's office on the issue of medical cannabis went unanswered. Correction: An earlier version of this story incorrectly stated that Gov. Justice allowed a bill dismantling the Department of Education and the Arts to become law without his signature. In fact, Justice signed the bill. An earlier version of this story also stated that lawmakers could call themselves back into session on matters not listed on the governor's call with a two-thirds majority. In fact, it would require a three-fifths majority of each chamber.